I like this palette better than the Naked palettes from Urban Decay because unlike those ones, I have more variety of shimmery, transition, and crease shades in here. 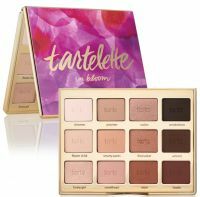 I feel like Tarte has decided to follow suit with Too Faced by making their palettes scented now. This palette smells like vanilla. My BIGGEST gripe about this palette is that it has two black shadows in here. Two! It was as if Tarte...read more decided to throw in a color without much effort just to fulfill a 12-pan palette. Smokeshow and Activist are pretty much the same color except that Smokeshow has a grayer undertone to it but on the lid, it looks the same. They should have offered us a more orange reddish shade because Rebel is too brown and I would like more contrast when it comes to my crease shade. These shadows are pigmented but they're not the easiest to blend in my opinion. I felt like I really had to work hard at layering and blending to get the effortless blended look I wanted. The nice thing about this is that there's not a lot of fallout. I love this palette. The colors are beautiful, pigmented and blend really nicely with each other. I didn't experience any fallout, and the color lasted a good amount of the day. It has such an amazing packing and pretty-looking colours which are blended well. The palette should have had more colours.